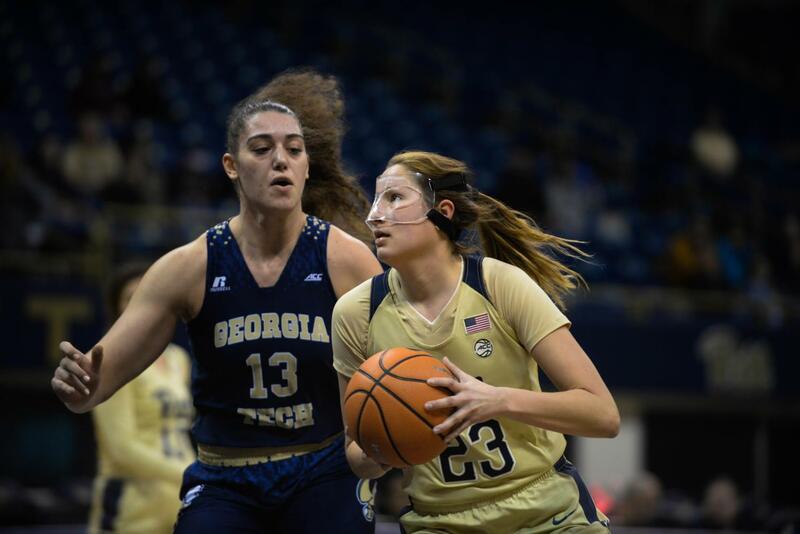 Pitt sophomore guard Alayna Gribble scored her last point of the day at the free throw line to give the Pitt women’s basketball team a 68-62 lead with one second left in Sunday’s game against Georgia Tech. Gribble scored a career-high 29 points in Pitt’s 68-62 victory as the Panthers claimed their first ACC win of the year. The Panthers (9-9 overall, 1-4 ACC) were in trouble coming into sunday’s game against the Georgia Tech Yellow Jackets (12-7 overall, 1-5 ACC). Riding a four game losing streak Pitt needed a win if it wanted to turn the season around. Junior guard/forward Yacine Diop, who has been the Panthers’ leading scorer this season, was relieved to get the first conference win of the season. In the first quarter Diop scored the Panthers’ first two buckets and six of their first nine points to start the game. Diop hit a layup with 3:09 left in the first quarter when the rest of the offense finally got going. Sophomore guard Jasmine Whitney hit a layup followed by a three from first year guard Kyla Nelson to bring the Panthers within two points of the Yellow Jackets at 16-14. Two Georgia Tech free throws brought the score to 18-14 at the end of the first quarter. After the timid start, the Panthers took off, starting the second quarter with an 18-0 run. Gribble, in her third game back from injury, started the run with two three-pointers on back to back possessions to give Pitt a 20-18 lead with 8:35 left in the half. Gribble was on fire in the first half leading the Panthers in scoring with 12 points on 4-6 shooting from the three-point line. At the end of the first half, the Panthers were 6-11 as a team from three while Georgia Tech failed to hit a three in the first half, going 0-8. A suffocating Pitt defense was also key in spurring the team’s second half run. Pitt recorded six blocks in the first half with four coming in the second quarter alone. Junior center Kalista Walters recorded three of the Panthers four blocks in the second and finished with four on the game, increasing her team high of 34 blocks on the season. Pitt’s lead inflated to 32-18 before Georgia Tech finally hit their first shot of the quarter with 1:40 remaining in the half. By the end of the half, Pitt held a 34-24 lead. Gribble picked up right where she left off in the second half, hitting her first two threes in the first three minutes of the third quarter. By the end of the third quarter, the Panthers held a 51- 34 lead. Gribble’s first 18 points came off of three-pointers alone before she hit her first two-point shot with 3:24 left in the third quarter to give Pitt a 44-32 lead. She finished the game with seven three-pointers, tying her own single-game school record. Gribble said confidence was key in her performance. The Panthers’ offense as a whole relied on the three, hitting 10 for the game. The disparity between Pitt and Georgia Tech’s three-point shooting was a huge difference in the game. Pitt was able to get 30 of their 68 total points from beyond the arc while Georgia Tech hit only two threes during the game, going 2-12 from deep. The Yellow Jackets made an incredible run in the fourth quarter, cutting the Panthers’ 17-point lead down to just four with one minute remaining in the game. Pitt head coach Suzie McConnell-Serio attributed Georgia Tech’s comeback to their press defense in the fourth. Georgia Tech outscored Pitt 28-14 in the fourth and almost completed the comeback. In the end, Pitt’s lead was too much to overcome as they left with the 68-62 victory. The Pitt women’s basketball team next plays the Louisville Cardinals on Jan. 18. Tipoff is at 7 p.m.